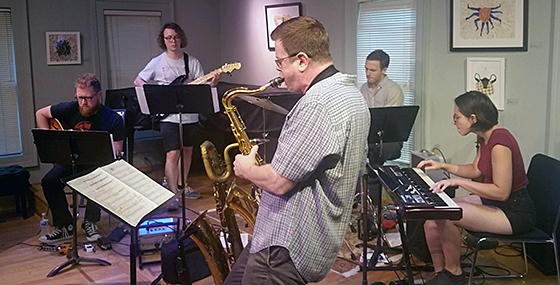 Chicago based saxophonist and bandleader Ken Vandermark visited Kerrytown Concert House on July 9 with his most recent incarnation of bands, Marker, which featured some talented younger musicians. The two guitarists Andrew Clinkman, and Steve Marquette gave the band a unique sound as did Marcie Stewart on keyboards and violin. Phil Sudderberg mastered the trap drums and together they provided a comfortable cushion of sound for Vandermark’s sax explorations. Mark Braun (Mr B) is by now a fixed attraction at the Ann Arbor Art Fair where he plays more or less non stop for the duration of the fair. 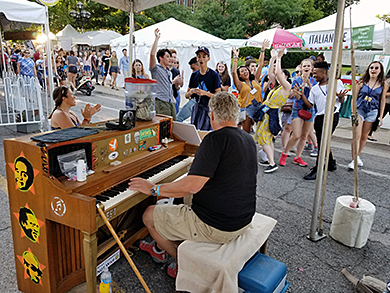 This year some U-M students were inspired to dance to his boogie rhythms and the rest of us listened and tapped our feet.